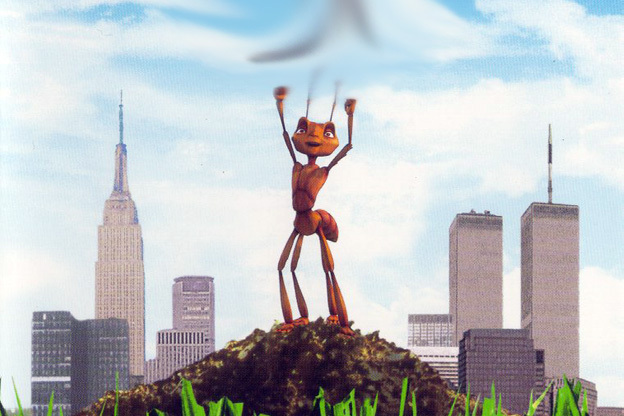 Image above: the 1998 movie “AntZ”. This post was inspired by a post by Antonio Turiel titled “Of Ants and Men” where he used the example of an ant to discuss the difficulties that humans have to perceive the real problems facing humankind today. Here, I examine again, a little more in depth, the same issue. Imagine yourself as an ant. What would be your perception of the world? Mainly, it is other ants from the same colony. As an ant, you are nearly blind but you have an excellent sense of smell and most of you sensorial inputs are the pheromones you receive from your sister ants that then you transmit to other ants. This kind of feedback-based pheromone exchange may lead to remarkably complex behaviors. Yet, the colony has no structure that we could see as a brain. If we define “self-consciousness” as the capability of a creature to model itself, the colony doesn’t have this capability. It can react to external stimuli, and it can do that fast. But it can’t plan for the future. It is the same for single ants: for them, the colony is a set of smells; they don’t really perceive it. Now, zoom back to your condition of a human being reading a blog post. What’s your perception of the world? You are probably smarter than the average ant, but, like an ant, your perception of the world is mainly shaped by the pairwise contacts you have with other human beings, members of the same colony. These stimuli are verbal, not olfactory, but the mechanism of transmission and retransmission is the same. Like an ant, you are continuously exposed to stimuli from the media and from social networks that you then retransmit to other humans. This often generates transient bursts of reinforcing feedbacks that may generate rapid, even violent, collective reactions on the part of the whole colony. But the human colony doesn’t have a brain, it can react to external stimuli but it can’t plan ahead. Those large human colonies called “states” don’t show an intelligent behavior; not more than ant colonies do. States explore their environment, compete for resources, occasionally fight each other, at times very destructively. But these are behaviors that ant colonies engage in as well. Of course, single human beings have abilities that ants lack: they are self-conscious in the sense that they can model their environment and themselves. They even have specific brain structures dedicated to this purpose, such as the “mirror neurons” used to model the behavior of other humans. But all this doesn’t seem to affect the behavior of the colony. The sophisticated modeling capabilities of human brains seem to be used mainly to gain an advantage in playing the sexual competition game between individuals. Outside of this realm, most humans probably see their “country” mostly as a semantic entity created by simple messages related to defense and attack. They have no perception of the immense complexity of a giant human colony of tens or hundreds of millions of individuals. Theoretically, however, the power of the human brain could be applied to the management of the colony. In history, we see the widespread attempt to place a single human being – that is, a single brain – in charge of the activity of the state. That sometimes leads to attempts of planning for the future of the whole colony, but it often backfires creating disasters. A single human brain cannot manage the immense complexity of a human state. Dictators, kings, emperors, and the like are normally just as clueless about the system they are supposed to manage as their subject. Maybe as clueless as the ants of an anthill. But, as well known, these studies had little or no impact and the world’s human colonies continued their blind path toward collapse. This is probably understandable. The emergence of complex structures such as brains is driven by evolutionary competition. Humans developed their large brains as tools for inter-group sexual competition. But states or industrial companies compete by exploiting the available resources as fast as possible. They have no advantage in the capability of planning for the long term, especially when the results of the planning is that they should slow down the exploitation rate. Doing that would only give more chances to their competitors who don’t. So, the behavior of human colonies remains dictated by one very simple rule: grow as much as possible and don’t care about anything else. Yet, the future remains impossible to predict: humans are clever monkeys and you never know what they may be able to invent. There may be ways to make the human colony conscious and that would lead to a whole new spectrum of behaviors that, at present, we can only vaguely imagine. For the time being, it seems that we can’t do much more than blindly keep at the impossible task of making the anthill great again. Because of our eusocial DNA we are unable to recognize the threat of the accelerating environmental planetary damage being one. Its potential damage is an emergent force too far outside our eusocial mental boundaries; “outside of the nest” emergent forces. We are unable to understand what these forces are in terms of our survival/non survival. That they are a threat to our planet and to our own continued existence on it will not register. We act violently to perceived threats to our nest from other groups outside of our nest. (family, social/religious groups, Nation states). We strike out without forethought. The history of war over the centuries and the international scene today shows this to be painfully true. Fortunately, these human deficiencies are beginning to sink into the minds of some. It is becoming clear to a segment of the human population that we will all have to change our eusocial thought process or we may risk extinction. Human beings have much to learn from ants …especially their tireless search for food and disciplined march. Ants are busy said Henry David Thoreau.